It was an emotional day on Tyneside following the death of former player Gary Speed and the Welshman was remembered with a minutes applause before the match. John Carver, the Newcastle coach and close friend of Speed, was visibly very upset during the tribute and had to be consoled by fourth official Mark Halsey. The match got off to a contentious start when David Luiz was booked for bringing down Demba Ba and denying the Newcastle front man a clear goalscoring opportunity after just four minutes - it so easliy could have been red. Luiz was then in trouble again after a heavy touch on the edge of his own area allowed Ba to win possession but John Terry was there to clear up. Sturridge looked lively early on and his burst into the Newcastle box was too much for Yohan Cabaye who tripped the young Englishman and referee Mike Dean pointed to the spot. Frank Lampard stepped up to take the spot-kick but was denied by an excellent save from Tim Krul diving low to his left. Replays suggested that Krul had crept off his line and a number of players were encroaching into the area as Lampard took his run up. Sturridge then had a flurry of chances, first lashing a shot against the upright, before seeing a long range effort fly just wide, a decent stop from Krul and a shot into the side netting deny him what would have been a well deserved goal. At the other end a Ba strike was stopped by a wonderful save from Petr Cech when he guided a Peter Lovenkrands cross with the outside of his boot towards the goal after 25 minutes. Shortly afterwards Juan Mata turned Danny Simpson inside out with a wonderful touch on the left wing before whipping an early ball into the box where Drogba was denied by an excellent Ryan Taylor challenge. Then after sustained Chelsea pressure, Danny Guthrie sent a cross into the box and Ba’s header hit the post and as the ball bounced back into play it struck Luiz and fell just wide of the goal. But Chelsea came back and broke the deadlock through Drogba who powered a header past Krul from a lofted ball into the box by the outstanding Mata. Sturridge was denied once again by Krul five minutes before the break with the Dutch ‘keeper saving his left-footed strike well. Alan Pardew attempted to shake things up at half time bringing Shola Ameobi into the fray for Hatem Ben Arfa. 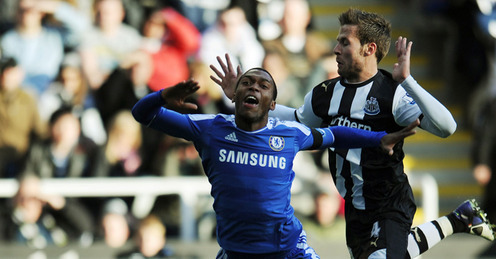 Ameobi was straight into the action as he saw his shot blocked well by Lampard. Then in an incredible 10 seconds Drogba headed against his own bar and as the ball was cleared Chelsea broke with pace and when Sturridge fed Ramires the Brazilian looked certain to score but Krul did enough to deflect the ball wide. The game quietened down somewhat after the hour mark with a single Shola Ameobi effort that was sent wide the only real chance of note. Mata prodded a reasonable chance wide while under pressure from Steven Taylor after 72 minutes before Sammy Ameobi saw his shot blocked on the line by Terry shortly after the Newcastle youngster had been brought on for Lovenkrands. As the match entered the final 10 minutes Shola Ameobi hit a superb effort that struck the Chelsea crossbar and had the crowd on their feet. At the other end Sturridge again failed to make the most of a good chance with Krul once more in his way. Krul made two further comfortable saves from tame efforts by Sturridge and Kalou before Guthrie saw a speculative effort sail over the Chelsea bar. Then with two minutes to play Chelsea found that elusive second goal through Kalou and the excellent Krul was unfortunate that his touch was not enough to keep the ball out of the goal. Sturridge then capped a fantastic all round performance with a goal to rub salt into Newcastle wounds, shooting low past Krul with his left foot. Newcastle will feel aggrieved that Chelsea finished the game with 11 men on the field but the victory was no less than the London club deserved and in truth they could have had five or six.